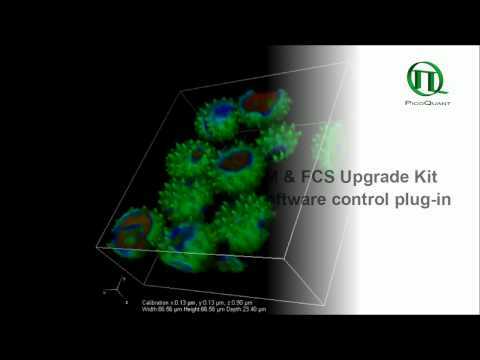 All samples containing commonly used fluorophores can be examined with the LSM Upgrade Kit. For this purpose, the excitation subsystem consists of a pulsed diode laser driver of the PDL Series and different laser heads with pulses in the picosecond time regime (additional CW mode is available as an option). The available wavelengths range from 375 to 900 nm. 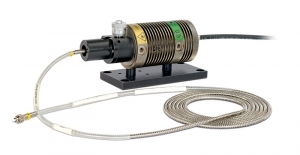 The laser heads are integrated along with multiple optical components in one Laser Combining Unit (LCU) for comfortable handling and coupling into an optical fiber enabling single or multicolor excitation. The sample background is significantly reduced due to the narrow excitation spectra of the lasers. 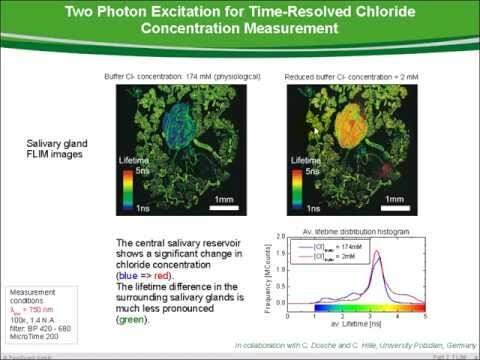 The repetition rate and laser power can be adapted via the laser driver to the fluorescence lifetime which minimizes bleaching of the sample. 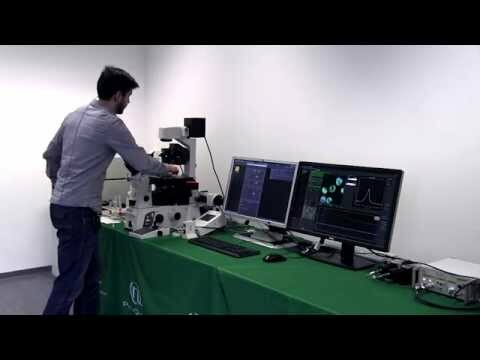 As an alternative to pulsed diode lasers, especially for multi-photon excitation schemes, short pulse laser systems such as Titanium:Sapphire lasers can be integrated as well. 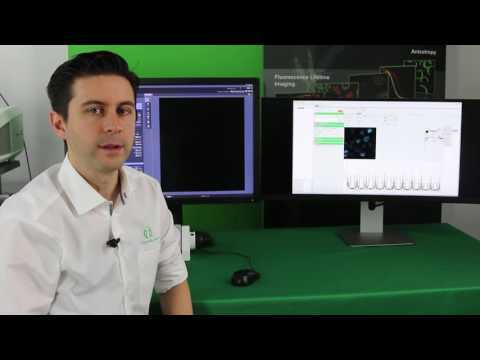 Fluorescence lifetimes down to a few picoseconds or even up to milliseconds for phosphorescence and luminescence studies are easily resolvable with the LSM Upgrade Kit. This broad measurement range covers almost all samples that are analyzed in life as well as material sciences. Time-resolved microscopy requires the registration of not only the photons themselves, but also their position in time and, for imaging, in space. The ideal technique for that purpose is the Time-Tagged Time-Resolved (TTTR) data acquisition developed by PicoQuant, which is a variation of the classical method of Time-Correlated Single Photon Counting (TCSPC). 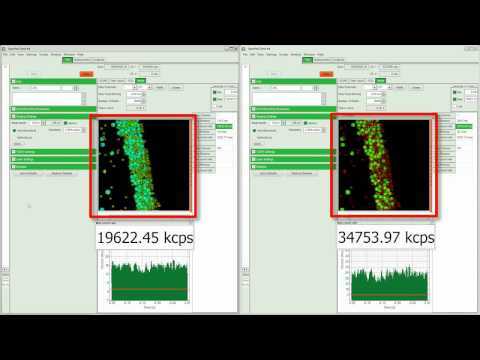 Using TTTR data acquisition vastly different measurement procedures, like FLIM, lifetime based FRET, FCS, or even coincidence correlation (“antibunching”) can be performed, based on just one fundamental data format. The TTTR format ist supported by all available TCSPC electronics from PicoQuant. Different modules with up to eight independent TCSPC channels for fast and parallel detection are available which provide highest data throughput, multi-stop possibility, and low dead time to realize short acquisition times. Hybrid PMTs and SPADs offer highest sensitivity as needed for single molecule experiments and are suited for, e.g., cellular FLIM and FCS studies at low fluorescence intensities. The detectors differ in their efficiency, temporal resolution, spectral range, or active area. 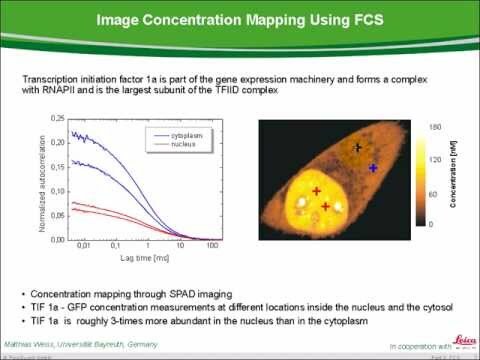 Thus, the choice of the detector depends on several factors such as the targeted application or interface to the microscope for confocal or NDD (non-descanned) detection. The detectors can be attached in confocal mode using a pinhole and fitting to all detector types, as well as in non-descanned detection (NDD) for multi photon excitation. 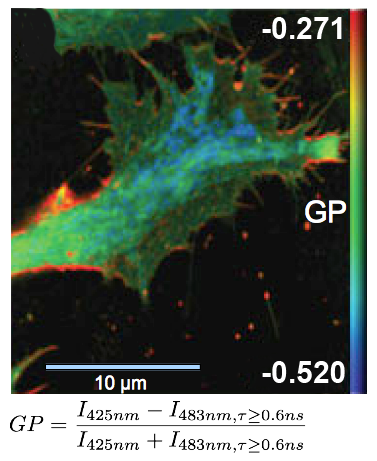 In the standard confocal mode, the detectors are connected via an optical fiber to the fiber exit port of the microscope. 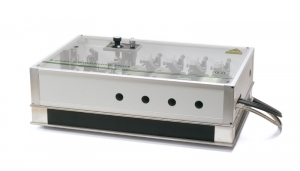 In this confocal configuration set-ups with up to 4 detectors are available. Integrated filter holders allow quick change of emission filters in order to adapt to different experimental conditions and fluorophores. The non-descanned configuration (NDD) is used in systems with a multi-photon laser and enables deep-tissue FLIM. In this case one or two detectors (PMTs or Hybrid PMTs) are connected to the LSM via a large core liquid light guide. The light guide is either mounted to a suited NDD port of the microscope or, alternatively, a specially developed dove-tail adapter collects the fluorescence directly above the objective. The latter approach features a very high collection efficiency due the light collection very near to objective and the high fluorescence transmission through the liquid light guide. 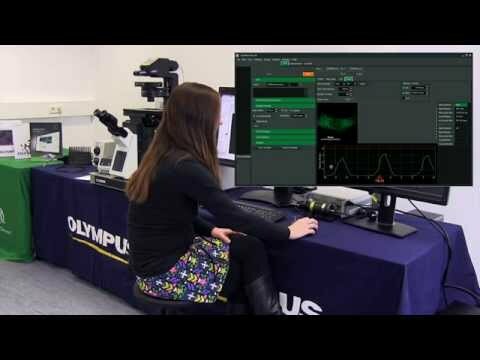 In case of the Olympus FluoView FV1000/1200 MPE system it is also possible to use up to four internal NDD standard PMT detectors of the LSM for FLIM measurements. 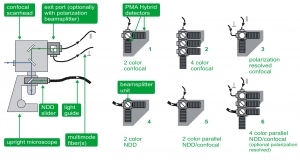 Parallel four channel set-up enabling confocal as well as non-descanned detection and optionally polarization measurements for multi color FLIM, FRET, deep tissue FLIM imaging, auto- and crosscorrelation (FCS, FLCS, FCCS, FLCCS), and anisotropy. All options are also available for inverse microscope setups. The system software SymPhoTime 64 provides multiple, easy-to-use acquisition and analysis tools for all kind of samples. 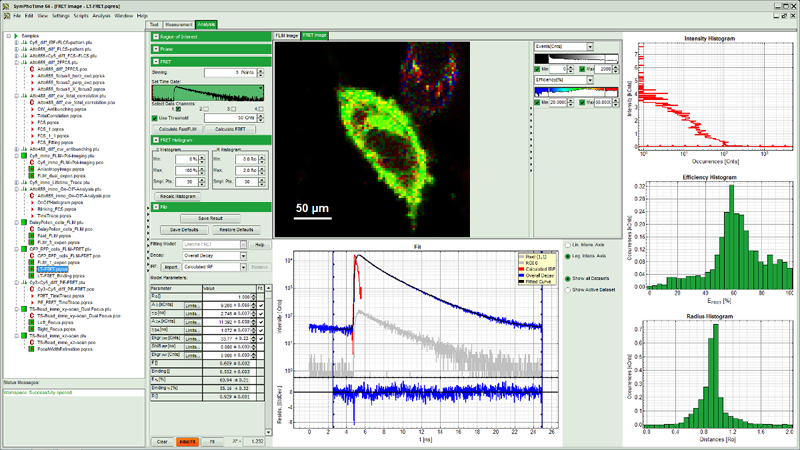 Based on the sophisticated data collection and handling, the system software SymPhoTime 64 supports a multitude of methods, such as Fluorescence Lifetime Imaging (FLIM), Förster Resonance Energy Transfer (FRET), Fluorescence Correlation Spectroscopy (FCS), Fluorescence Lifetime Correlation Spectroscopy (FLCS), intensity time trace, burst analysis, lifetime histogramming, and anisotropy, to name only a few. SymPhoTime 64 data handling maintains a transparent data structure where all derived data is stored in one workspace, including a log file to keep track of all measurement and analysis steps. Image data can be processed further or exported to standard formats. A large number of algorithms for those methods are already integrated in the software, providing a analysis platform for ready-to-publish data. At the same time, SymPhoTime 64 offers enhanced flexibility for the integration of novel, cutting edge algorithms by the user. A dedicated scripting language interface allows to modify and expand the analysis routines according to the experimental needs. 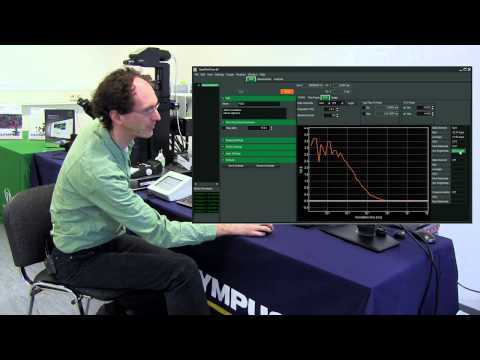 A specially developed interface between the SymPhoTime 64 and the LSM software (Nikon and Leica) strongly facilitates data acquisition and enables straightforward recording of, e.g., FLIM images up to 4096 × 4096 pixels, time series FLIM, z-stacks as well as single and multipoint measurements for FCS. 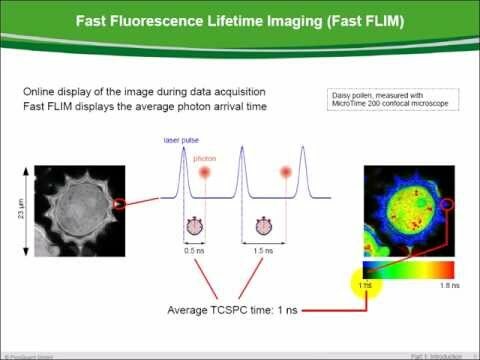 Online previews of the main parameters (Fast FLIM, FCS, time-traces, or TCSPC histograms) allow to quickly optimize data acquisition. For details, please check the selection chart for FluoView FV3000, FluoView FV1000 (MPE) / FV1200 (MPE), and FVMPE-RS. For details, please check the selection chart for Nikon A1, C1si and C2+, C1 and C2. 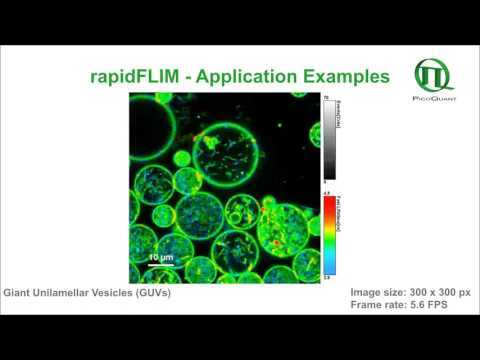 For details, please check the selection chart for Zeiss LSM 710 / 780 / 880.
rapidFLIM measurements enable the imaging of dynamics in fluorescence lifetime. 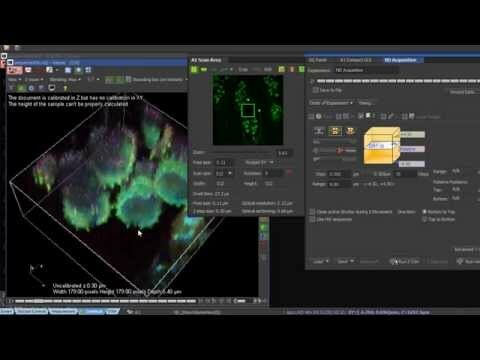 This new approach allows for fast FLIM acquisition with several frames per second as well as imaging of dynamic processes (e.g., protein interaction, chemical reaction, or ion flux), highly mobile species (e.g., mobility of cell organelles or particles, cell migration), and investigating FRET dynamics. More than 10 frames per second can be acquired, depending on sample brightness and image size. Unilamellar vesicles can be produced in a size regime ranging from giant (GUVs) to large (LUVs), and even to small (SUVs). The flexibility in membrane composition and possibility to introduce specifically labeled lipids increase the importance of unilamellar vesicles for studies in cell biology. Thus turning such vesicles a very powerful model to investigate e.g., membrane domain formation as well as lipid organization in membrane micro-domains. Until now, acquiring FLIM images took up to several minutes and due to the high mobility of GUV's, imaging them accurately is difficult. 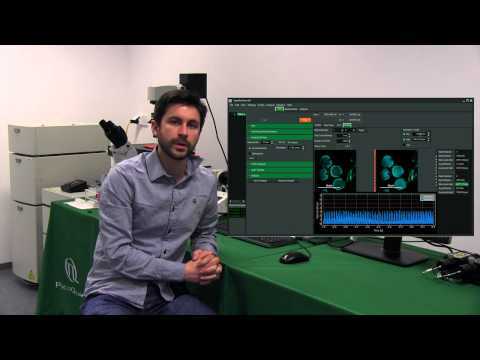 Applying the rapidFLIM approach significantly decreases the acquisition time, allowing to record up to several frames per seconds. Thus even highly mobile GUVs can be precisely tracked. In this example, two fluorophore labeled lipids (C6-NBD-PC and N-Rhd-DOPE) were incorporated into GUVs. In non-phase separated GUVs, the lifetime of NBD (7-nitrobenz-2-oxa-1,3-diazol-4-yl) is strongly quenched (down to ~2 ns) due to FRET to the acceptor rhodamine. The video shown here contains 300 frames that were recorded with a frame rate of 5.6 fps. FLIM measurements facilitate the differentiation between ordered and disordered membrane phases. The membrane dyes Laurdan and di-4-ANEPPDHQ can be used to image membrane order due to a spectral blue-shift in the fluorescence emission as well as a lifetime shift between the liquid-ordered and liquid-disordered phases. These images typically take the form of a normalized intensity ratio image known as a generalized polarization (GP) plot. Here, the known excited state photo physics is exploited via Time-Correlated Single-Photon Counting (TCSPC) to demonstrate GP contrast enhancement for these two probes. The image shows a GP plot of a Laurdan stained, fixed BAEC cell that combines lifetime and spectral changes. The plasma membrane at the cell surface shows higher order (red) compared to the inner cell compartments (blue).